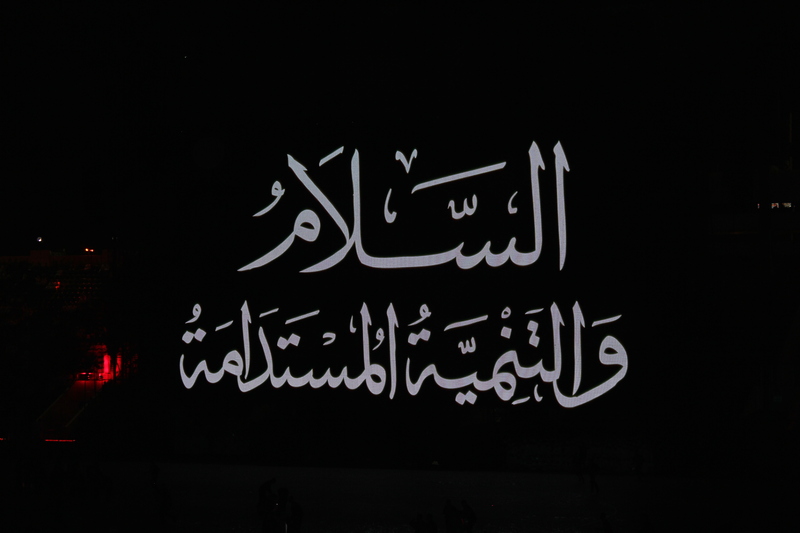 As-salaam wa al-tamniyah al-mustadaama: Peace and Sustainable Development, the title of the Student Pageant for the 40th National Day Anniversary Celebration. 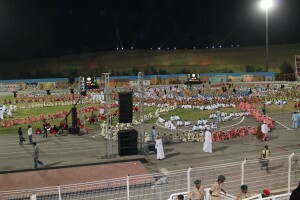 This tribute in Muscat to the nation and its leader and seven other pageants like it in provinces around the country are organized by the Ministry of Education and its regional branches and performed by public school students aged 4-17. The Muscat Student Pageant was titled “Peace and Sustainable Development” its patron, Sayyid Fahd bin Mahmoud al Said, Deputy Prime Minister for the Council of Ministers presided over the event. The scene was remarkably rowdy in comparison to the opening celebration and the military tattoo that I described in my earlier posts. Attended by family members and friends, many of whom participated in something like this themselves when they were students, the crowd hooted and hollered through the evening, applauding each entering troupe and every change of scene. The three young women sitting next to me seemed to lead the cheer. Their outfits complimented by green, red, and white scarves,the colors of the flag of Oman, Arwa, Asma, and Ahlam were spirited and very informative seat-mates for the Muscat pageant. Another difference from the military show was the use of some very spiffy production techniques. 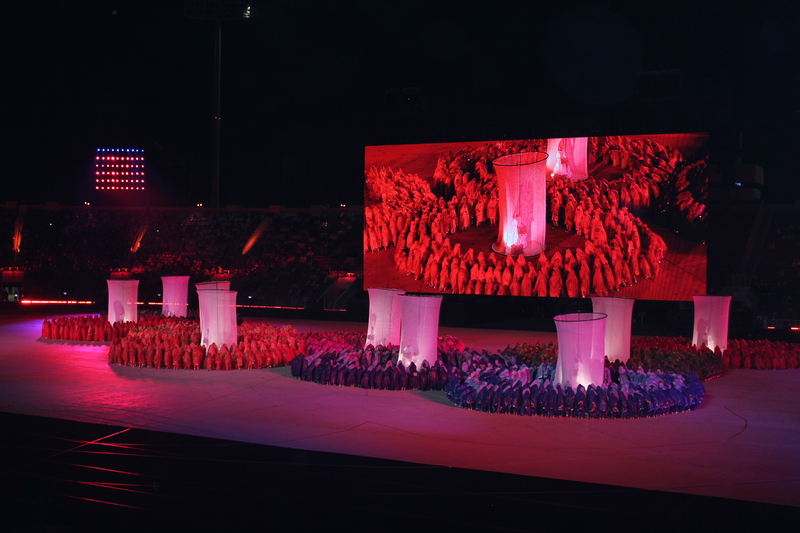 The action on the giant screen (JumboTron) played in counterpoint to that of the students on the ground, either by displaying overhead shots of the impressive formations made by hundreds of coordinated bodies or by complimenting their action with additional narratives in the way of images, animation, or live actions films. Mahrajan at-Tulab. Students formations are seen from over head on the JumboTron. This technology is contracted out, in this case with a German firm. The sound and tech for the Asian Beach games currently ongoing is taken care of by the company LAX from China. LAX also did the Beijing Olympics. According to the members of LAX who are staying at my hotel -- the bring all the gear, speakers, chords, mikes, JumboTron and so forth. When the first notes of the pre-recorded soundtrack for the show played I thought “Wow!” And when I heard the ‘ud player, always present in the mix and with many solo parts to himself I thought “who is this guy?, I need to meet him!” Then when I heard the voice of the qanun (zither), and the nay (flute) (traditional instruments of the Arab mashriq), a full and robust choir of men and women often sharing half lines of text in alternation, and childrens’ voices singing in tune, I started asking around. Who are these musicians? Who made this recording? 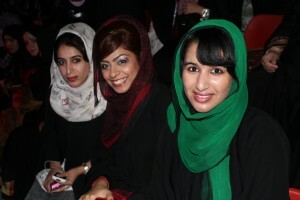 Is this Omani music and are these local musicians? The slick, high production values of the musical review was stunning, combining according to the publicity for the event, “International, Oriental and Traditional” music. Nine distinct compositions, one for each tableau, were framed by the same introductory music, used also for interludes during changes of scene. As it turns out many aspects of this production were contracted out, and the recordings (for both the Muscat soundtrack and the individual musical reviews in the provinces ) made in Egypt. 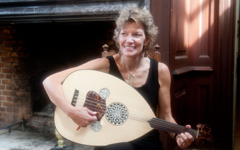 I was also told however, that the song-texts and at least parts of the melodies, were composed by Omanis. And many people that I queried about this aspect of music patronage and multi-nationalism in Oman insisted that Muscat had the studios and the manpower to do the recordings but that “it was much cheaper to do this in Cairo.” Even if the studios and the technicians are here, the music – with qanun, nay, mizmar (or its synthesized equivalent) and a thick ribbon of violins performing super-notey and virtuosic-lawazim or filler phrases in nearly every empty beat between melody phrases – are definitely from elsewhere. Certainly the sounds of Egypt (and Lebanon) with their ensembles, their repertoires, their approach to arranging and their famous voices have been dominant in the Arab, and the Muslim world through a variety of mass media, for decades. What is striking here is that rather than mimicking this music, perhaps localizing it in the process, a phenomenon I have observed in Indonesia, this music is imported, thus excusing, at least in part, the consumers from the process of production. 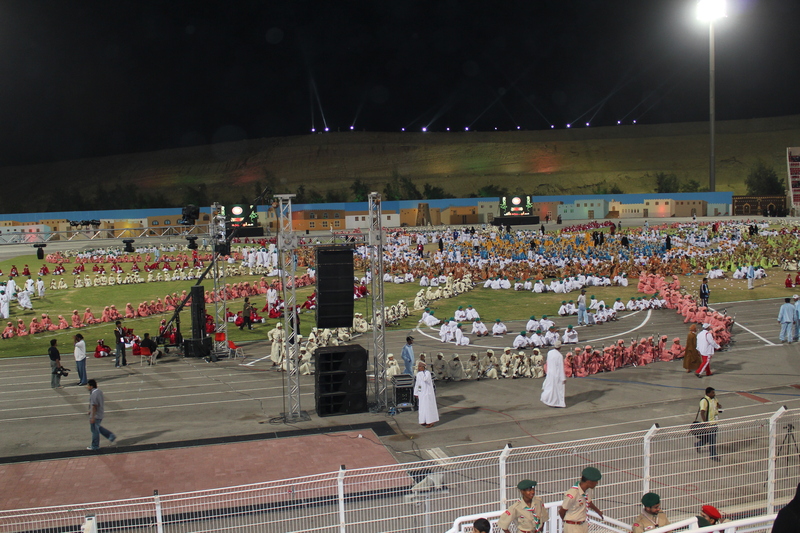 This is quite different than the marching band phenomenon: I described my posts on the opening events for National Day. In that case the tradition of military band performance may have originated elsewhere but it has been embraced, reproduced, localized and indigenized. Here, although the raw materials were from Oman (lyrics and melody), the final product was contracted out. This description is not at all meant to be judgmental. 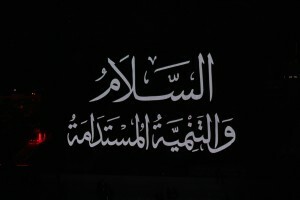 Rather, the processes involved in the localization of the marching band on one hand, and importing the modern recording-studio Egyptian firqah (big ensemble) on the other, are simply manifestations of different ways that sounds circulate, and these practices reflect various patterns and priorities that seem to be in place here. The four extravagant and impressive performances of nationalism, gratitude, and obedience that I have attended have several common attributes. There are also some things that are absent from these scenes: snacks and souvenirs, stuff for sale. Although these events have all taken place in large stadiums there are no stalls, no booths, no refreshment stands, no roving hawkers of peanuts and popcorn – or the equivalent national munchies – to keep us energized during the 4 or 5 hours required to attend one of these celebrations. It seems that some class of petty entrepreneurs could be taking advantage of the teeming thousands of audience members and participants who might be in need of food and drink. But no, people consume only what they bring and they almost “leave no trace,” “taking only photos, and leaving only footprints” as is said among the environmentally conscious where I live. As a result, the stadiums are not trashed inside or out; just a few plastic bottles and abandoned programs remain when the crowd departs. I asked my neighbor at the student pageant in Sur about the absence of snacks and she confirmed that: no – public sales of refreshments, even in official booths at a stadium, is simply not done. She indicated that such a practice would be seen as crass and unnecessary. The contrast to say, a sporting event in the US is striking. And in Indonesia, where I have spent more than two years trying to “figure things out” petty capitalism is everywhere. Hawkers of an array of culinary delights walk through the neighborhood streets, line the perimeters of public performances and dot the cityscape and people of all classes in Indonesia enjoy their services. Merchants of water, toys, and single cigarettes even infiltrate lanes of traffic stopped at a light. And I have seen similar practices in a variety of locations from Los Angeles, to Egypt, to Thailand. In Oman, at least the Oman that I have experienced for two weeks, there seems to be none of this. Could it be that this is a country without street food? Could this be part of the reason that it is a clean and orderly place? that I notice because it is not there! There are people that hang out in the parking lots and offer to wash your cars with a rag and a bucket – and perhaps this is petty capitalism – but they could also be employed or licensed, I’ll ask around. It seems that the title of the Student Pageant: “Peace and Sustainable Development” is as much a reflection of the present state of things as it is a continuing goal for the future.